BEIRUT: Russia has warned that any US missiles fired at Syria would be shot down and the launch sites targeted, raising the possibility of a US-Russian confrontation as Donald trump threatened to launch missile attacks despite the Russian warning. “If there is a strike by the Americans, then … the missiles will be downed and even the sources from which the missiles were fired,” Alexander Zasypkin, the Russian ambassador in Beirut, told Hezbollah’s al-Manar TV, speaking in Arabic. He said he was referring to a statement by Russian President Vladimir Putin and the Russian armed forces chief of staff. “Get ready Russia, because they will be coming, nice and new and “smart!”” Donald Trump tweeted on Wednesday. 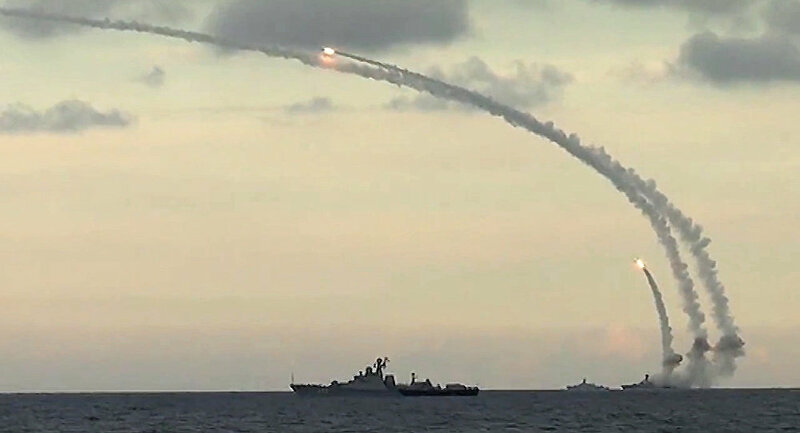 Russia vows to shoot down any and all missiles fired at Syria. Get ready Russia, because they will be coming, nice and new and “smart!” You shouldn’t be partners with a Gas Killing Animal who kills his people and enjoys it! Earlier in the week, Russian Deputy Foreign Minister Mikhail Bogdanov said there was no threat of the situation in Syria spiraling into US-Russian hostilities. TASS news agency quoted him as saying he believed common sense would prevail. The Russian military said on March 13 that it would respond to any US strike on Syria by targeting any missiles and launchers involved. Russia is Assad’s most powerful ally and its devastating air power has helped him wrest back large swathes of territory from rebels since 2015. Moscow and Washington sparred at the United Nations on Tuesday over the use of chemical weapons in Syria as Washington and its allies considered whether to strike at Syrian government forces over the alleged poison gas assault. At least 60 people were killed in Saturday’s suspected chemical weapons attack on the town of Douma, Syrian relief workers said. An estimated 500 people were being treated for “symptoms consistent with exposure to toxic chemicals”, the World Health Organisation said on Wednesday. The Syrian government and Russia say the reports are bogus. The Kremlin said on Wednesday it hoped all sides involved in Syria would avoid doing anything that could destabilise an already fragile situation in the Middle East, and made clear it strongly opposed any US strike on its ally. After the attack, the rebel group holed up in Douma – Jaish al-Islam – finally agreed to withdraw from the town. That sealed a big victory for President Bashar al-Assad, who has now crushed the rebellion in the eastern Ghouta region near Damascus. On the diplomatic front, Moscow and Washington stymied attempts by each other in the UN Security Council on Tuesday to set up international investigations into chemical weapons attacks in Syria. Zasypkin also said a clash between Russia and the United States over Syria “should be ruled out and therefore we are ready to hold negotiations”. On Monday, UN Syria peace envoy Staffan de Mistura cited the air base strike along with other recent events in Syria in a briefing to the Security Council, cautioning against a “situation of uncontrollable escalation”. Syria’s Russian-supplied air defences shot down an Israeli F-16 jet in February during a previous bombing run against what Israel described as Iranian-backed positions in Syria. Last year, the United States carried out strikes from two Navy destroyers against a Syrian air base after another toxic gas attack on a rebel-controlled pocket. The US and Russian militaries have sought to avoid conflict in Syria, notably last year in the Euphrates River Valley where they supported rival sides in the campaign against Islamic State militants. However, US forces in February killed or injured hundreds of Russian contractors fighting on Assad’s side during a confrontation in Deir al-Zor province. US officials said last month pro-Syrian government forces including Russian mercenaries massed near US and US-backed forces in the same region, but a potential confrontation was defused after the US military contacted Russian officers. French President Emmanuel Macron said on Tuesday that any military action would not target the Syrian government’s allies or anybody in particular, but rather the Syrian government’s chemical facilities. Any US strike similar to the limited one launched last year would not cause a shift in the course of the war that has been going Assad’s way since Russia intervened on his side.